NOTE: If you initiated the integration prior to August 2018, check the App reinstallation part at the end of the article. STEP 1: Navigate to your Slack settings, find the section Leadfeeder users matched with Slack users. Map each Leadfeeder user to the corresponding Slack username. STEP 2: Make sure you’ve defined the default channel to send the leads to, and opted-in this feature next to Send notification to Slack when assigning leads. NOTE: If you don't want to get notification when someone assigns a lead to themselves, check the other box as well. 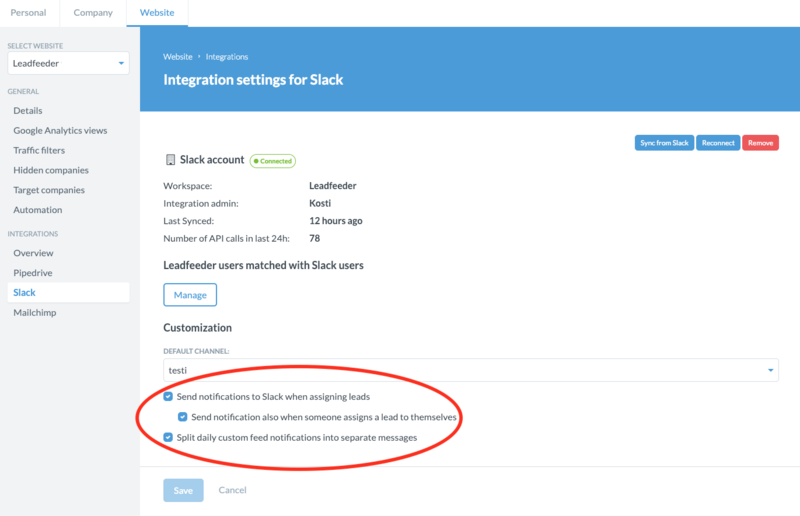 If you initiated the integration prior to August 2018, that means that your Leadfeeder Slack app won't have powerful enough permissions to do the tagging of assigned leads. STEP 1: Navigate to your Slack settings and click on Reconnect. STEP 2: You will prompted to give Leadfeeder certain permissions. NOTE: These permissions are elevated compared to the permissions you gave to the Leadfeeder Slack app before this feature release. It is required for this feature to work. Contact support@leadfeeder.com in case you have any questions.